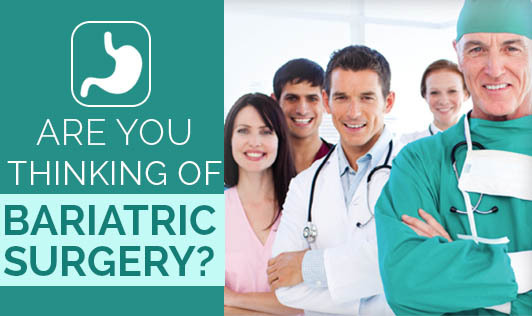 Are You thinking of Bariatric Surgery? Bariatric surgery is a life-altering experience. The purpose of surgery is to help those people lose weight and improve their overall health who are morbidly obese or suffer from life-threatening weight-related health problems. For many people, it may be appealing to go for bariatric surgery to lose weight and enjoy an improved quality of life, but the procedure is not for everyone. Weight loss surgery isn't an alternative to diet and exercise, it is in addition to diet and exercise. In fact, good eating habits and regular exercise become even more important after bariatric surgery. A BMI of 35 or higher and a serious health condition related to obesity, such as diabetes, high blood pressure, heart disease, sleep apnea, joint pain, etc. Inability to achieve weight loss with diet and exercise. Willing to follow the lifestyle changes that are necessary after surgery. Weight loss surgery is not for everyone who is severely overweight. You may need to meet certain medical guidelines to qualify for weight-loss surgery. After you qualify for weight loss surgery, you have to prepare for the operation. You need to have various lab tests and medical examinations before surgery. You may also have restrictions on eating, drinking and medications you can take and also need to stop any tobacco use. You must start regular exercise and physical activity. Post-surgery also, you may have frequent medical checkups to monitor your health after the surgery. You may also need to go for lab tests and medical examinations post-surgery. You have many restrictions or limitations on how much and what you can eat and drink. You must learn to cope with the recovery time and to adjust to a whole new way of eating and living. Bariatric surgery has significant health risks and side effects like bowel issues, dumping syndrome, Low blood sugar levels, nutritional deficiencies, vomiting, ulcers, etc. The long-term success of surgery depends on your ability to make permanent changes in your lifestyle. To get the best results after the surgery, you must make permanent healthy changes in your diet and lifestyle and be regular with your physical activity and exercise regime. But, these efforts may be worth it for people who are very obese and have serious health problems because of their weight. So, if you're worried about your weight or think you may benefit from weight loss surgery, talk to your doctor.